1.1. 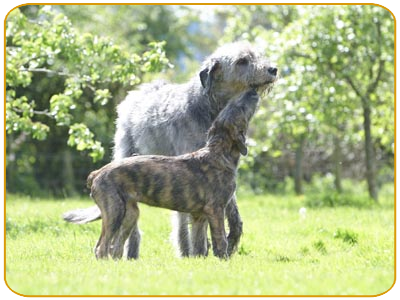 The Irish Wolfhound Club is committed to protecting your personal information and respecting your privacy. 1.2. This Privacy Notice sets out the basis on which any personal data that we collect from or about you, or that you provide to us, will be processed by us. 1.3. For the purpose of the General Data Protection Regulation [the GDPR], the data controller is The Irish Wolfhound Club. 1.4. We may update this Privacy Notice from time to time. Please check back regularly to see any updates or changes to this Notice. 4.1. We process personal data about members, judges, ring stewards and competitors/exhibitors to our events. The categories of person about whom we process personal data are described in more detail in the Annex to this Privacy Notice. 5.1.6. The right to data portability. 6.1.4. To assist with upholding our club constitution and taking action in cases where there may be a breach of the Club rules or Codes of Ethics. 6.2	We will ask for your direct consent IF we intend to use your personal data for marketing purposes. Where our processing of personal data is based on your having given consent, you have the right as a data subject to withdraw that consent at any time. If you wish to invoke this right, please notify the Secretary using the contact details set out in Section 2 above. 7.1. We may use service providers to help us provide you with our services. Personal data may be transferred to such service provider, who act for or on our behalf, for further processing in accordance with the purpose(s) for which the data was originally collected or may otherwise be lawfully processed. 7.2. Such third parties have contracted with us as data processors under the requirements in the GDPR. They are contractually bound to only use personal data for the agreed purpose(s). Relevant persons working for these third parties will have access to your personal data under the terms of the data processor contract, but only to the extent necessary to perform their services for us. 7.4. In appropriate circumstances we may disclose data to authorised bodies as required by law. 9.1. Please contact the Secretary above if you have any questions or concerns about personal data and privacy matters. This Annex sets out the Irish Wolfhound Club’s processing of personal data relating to members (including committee members), judges and exhibitors/competitors at our events. PIP Printing Hereford for the printing of magazine and yearbook. We provide the Kennel Club with details of The Irish Wolfhound Club’s officers and Challenge Certificate winners at our events in order to meet requirements in the Kennel Club Rules and Regulations. Any financial data arising from a transactional process will be held securely by the Irish Wolfhound Club in accordance and compliance with all statutory and HMRC requirements.